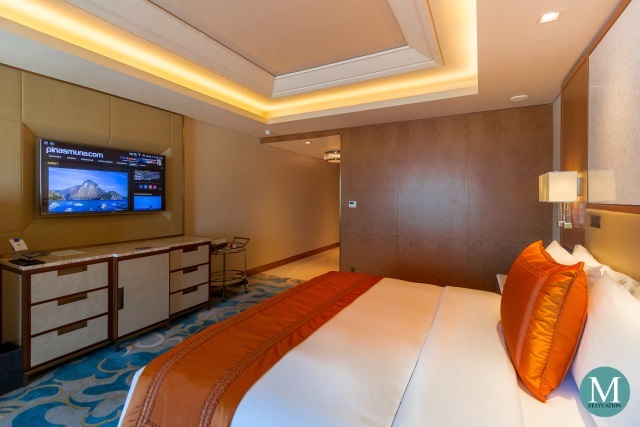 The Grand Deluxe Room is the highest guestroom category of The St. Regis Macao boasting of 80 square meters of luxury. The room enjoys a lot of natural light flowing in through the large windows with the blue skies extending inside the room through the oriental-inspired pattern of clouds on the floor carpet. 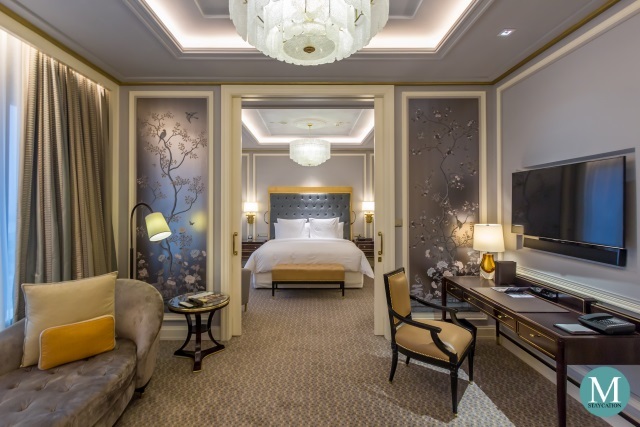 The wood paneling adds a classic luxury feel into the room while Western-inspired lighting fixtures and furniture reflects the Portuguese heritage of Macao which harmoniously blends with the local Chinese culture. Macao being a coastal city, elements of the sea are also represented inside the room through the mother of pearl artwork on the feature wall. Guests are welcomed by a platter of fresh fruits and a local treat of Macanese Almond Cookies, indeed a delightful way of starting your holiday in Macao. Just like in any St. Regis property, there is an immense sense of personalized service at The St. Regis Macao, starting from the little things such as a hand-written welcome note to the luggage unpacking by a 24-hour butler service. 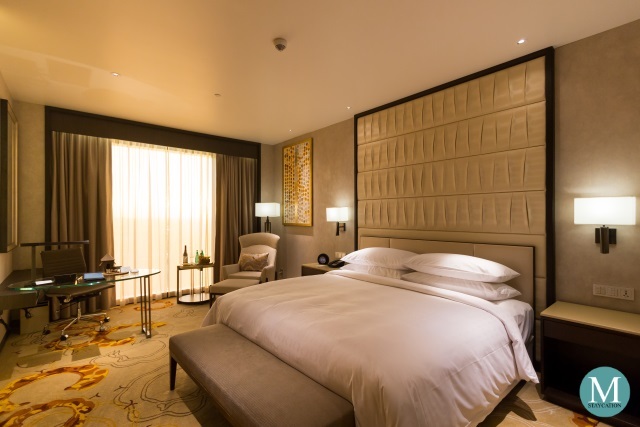 The Grand Deluxe Room is furnished with a king-size signature St. Regis bed with plush mattress and smooth while linens. 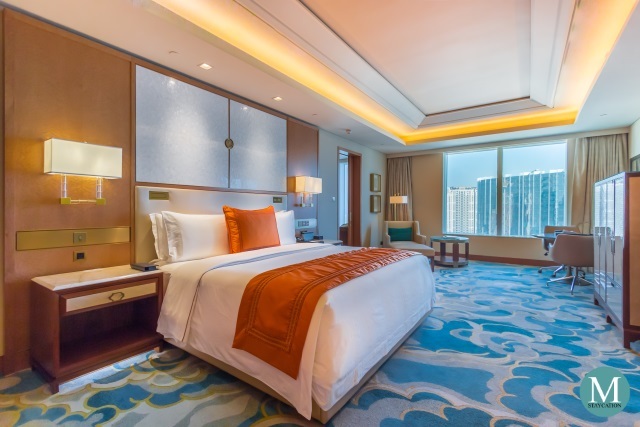 Whether you find yourself in New York, Rome, Dubai, Singapore of Macao, the St. Regis bed guarantees the best sleep quality. 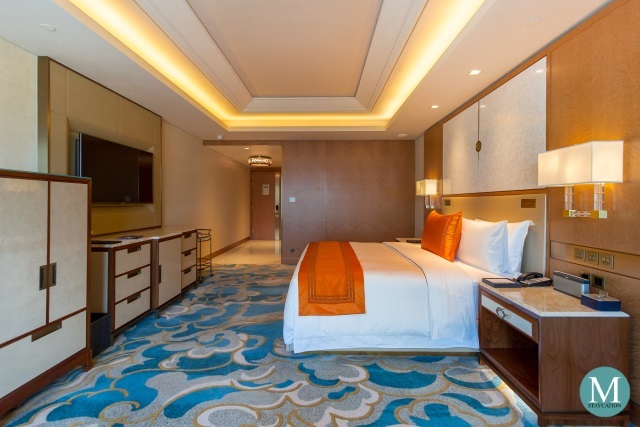 The Grand Deluxe Room is also equipped with state-of-the-art entertainment systems such as a 55-inch Smart LED television with local and international cable channels and wireless mobile connectivity for streaming audio and video from smart phones. 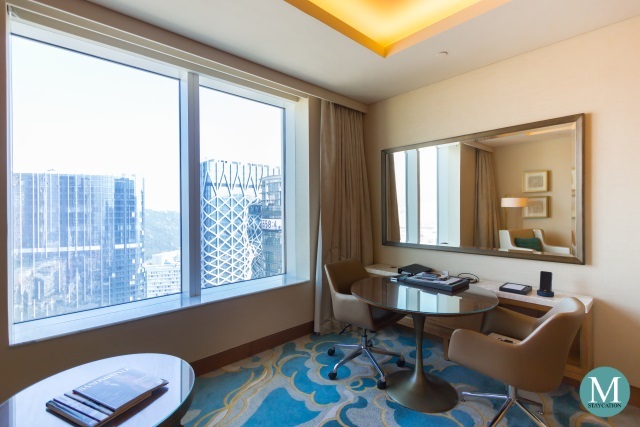 The room is also equipped with modern conveniences such as the bed-side controls for the curtains. Next to the window is a living space with a spacious round table that can either function as a work station or as a dining table. There is also a separate leather couch and ottoman with a coffee table. 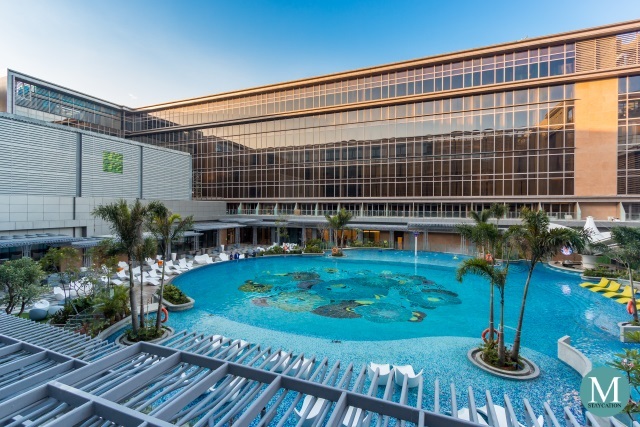 Complimentary high speed wifi internet is available inside the room and at the hotel's common areas. 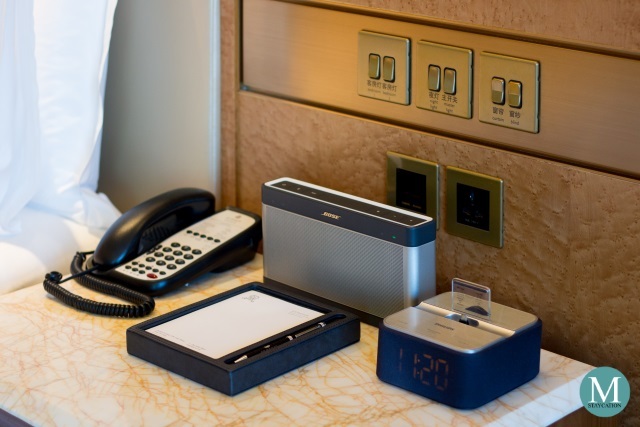 Each room is also provided with a complimentary use of a handy mobile phone which has mobile internet and mobile hotspot capabilities. 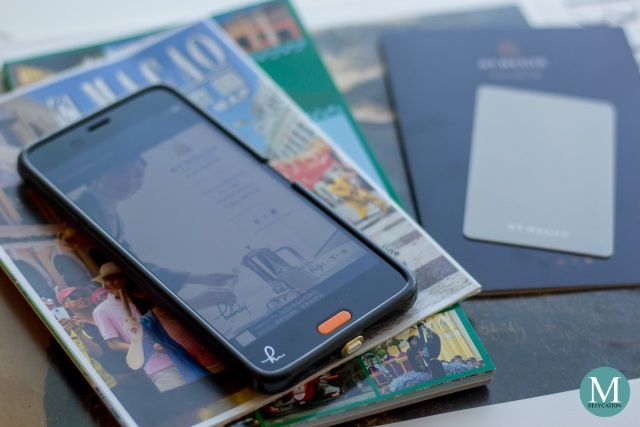 The handy mobile phone also allows the guests to make complimentary local and international calls to select locations around the world. 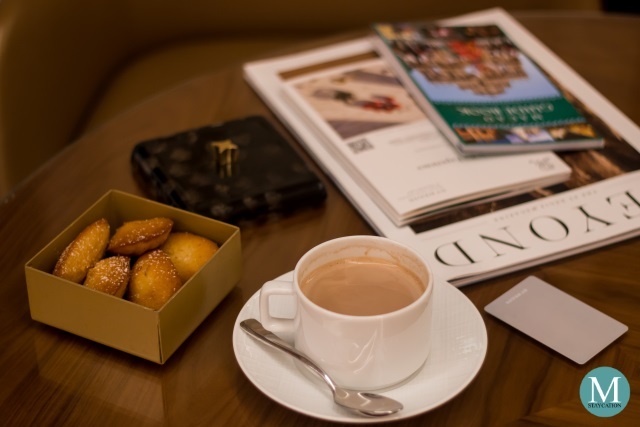 All-day complimentary drinks such as brewed coffee, cappuccino, latte, chocolate, tea and bottled water are available via the 24-hour St. Regis Butler Service. 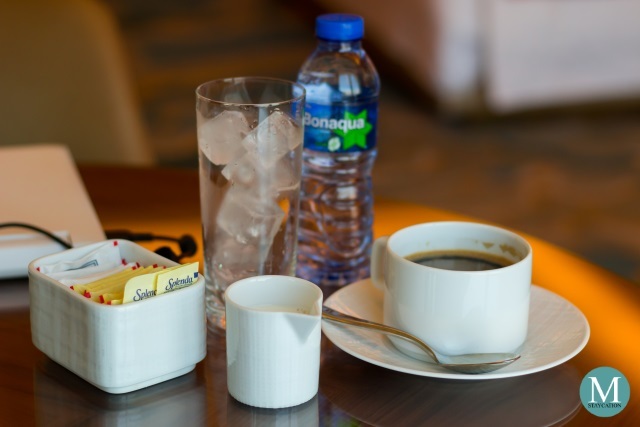 Upon arrival, while working in your room, watching movies or simply enjoying the view from the couch, you simply have to call the butler service and order your preferred drink and it will be served in no time. 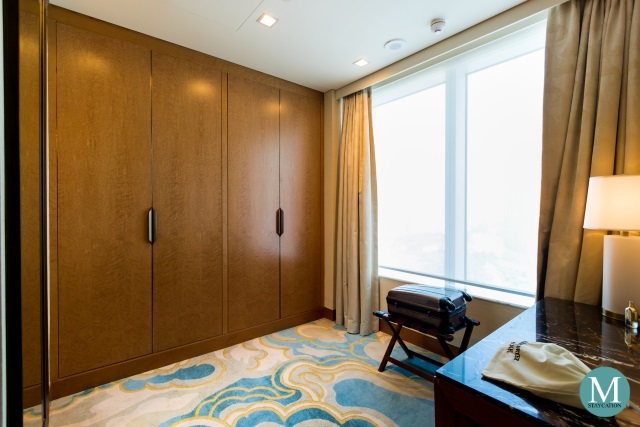 The Grand Deluxe Room also has a separate dressing room which houses a spacious closet cabinet and a vanity table. Upon arrival, you simply have to relax at the couch and let the butler service unpack your clothes for you. Guests are also entitled to complimentary pressing of clothes per day. Adjacent to the dressing area is the spacious white marble bathroom. 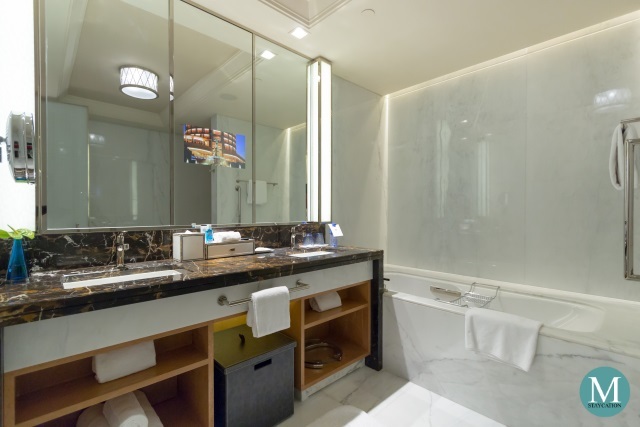 It has a dual vanity with a huge wall mirror mounted with an LCD television. There is enough countertop space to place your personal toiletries. There is a separate lavatory and a separate walk-in shower fitted with a hand-held and a rainfall shower head. Highlight of the bathroom is definitely the deep soaking bath tub. 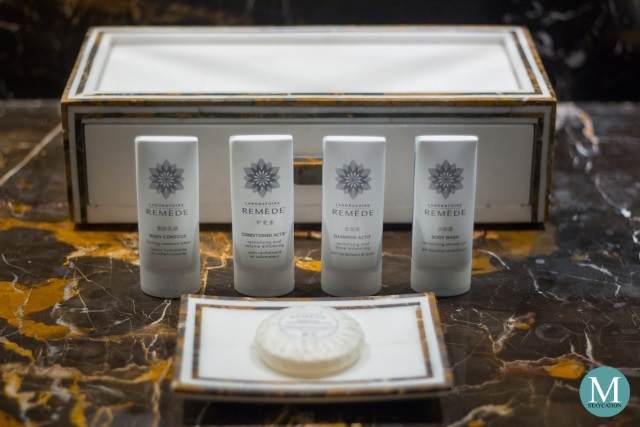 Guests staying at The St. Regis Macao are provided with the indulgent body and bath amenities by Laboratoire Remède, a New York-based producer of skin- an hair-care products. 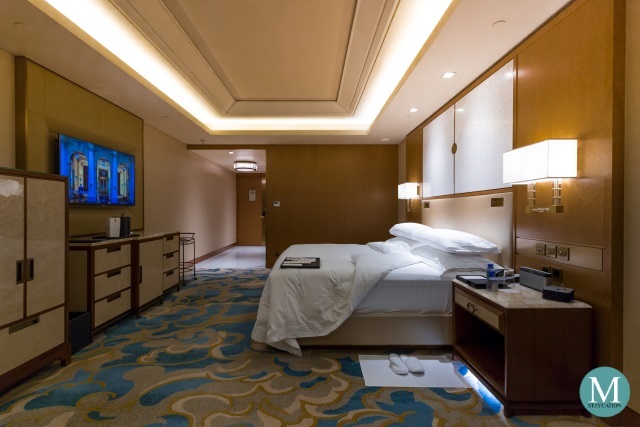 After a day of exploring Macao, guests can look forward to their bed already prepared by the turndown service. Just remove your shoes, switch to your bedroom slippers and head to the bathroom for a warm shower. 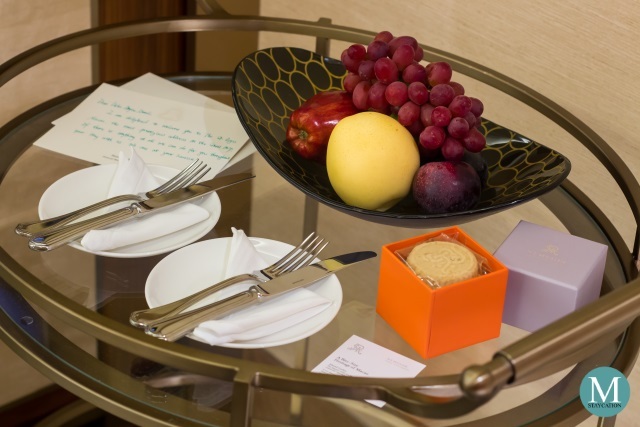 Don't forget to check your table for the midnight snack prepared for you by the turndown service. 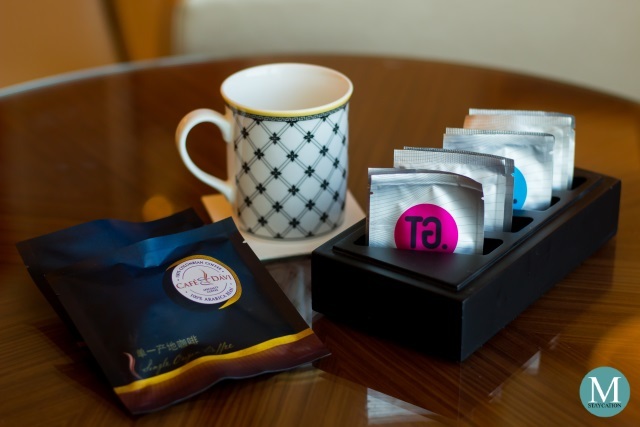 Feel free to call butler service should you wish to pair your snack with coffee, tea or even a glass of warm milk. 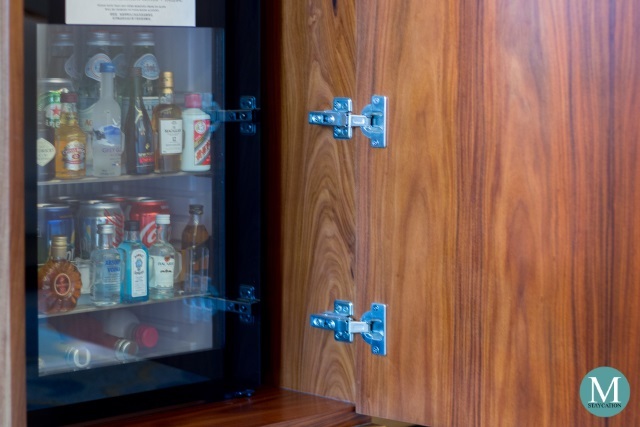 If you prefer a drink not offered by the complimentary butler service, do check out the extensive selection of canned and bottled drinks as well as premium liquors and spirits inside the minibar. Note however that items inside the minibar are not complimentary. 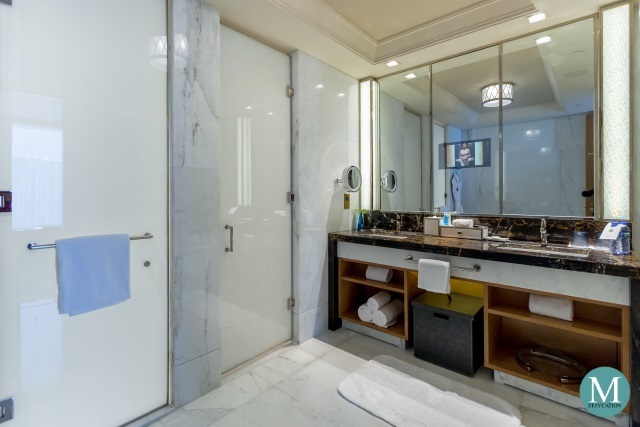 In addition to the complimentary drinks offered by the butler service, complimentary coffee and tea making facility is also provided inside the minibar cabinet. There's drip coffee and tea bags available. Guests can use the electronic kettle to heat water. It's great to have this option to make your own coffee or tea.